Intellectual property, developed in the biology and electronics labs of our great universities, is being methodically transferred to industry, reports independent scholar and journalist Washburn. For the past two decades or so, she argues in her first book, institutions of higher learning have sold out the public weal for private wealth. The sciences, generally sponsored by big business, do quite well while the humanities lose in scholastic budget battles. It’s not Chaucer who pays the bills. On campus, research comes before science teaching; targeted study supports corporate needs; proprietary and secret investigations are replacing platform research and shared information. 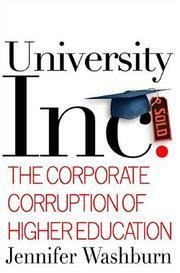 Supported by federal legislation, researchers simultaneously serve two masters: their educational institutions and the mighty corporate sponsors that fund their studies. These researchers frequently have personal financial interests in the results of their often-tainted science. In exchange for cash, stock, and corporate titles, the sponsors retain important rights in the studies, including control of journal reports. Big money is involved, and no one should be surprised that virtually every college, from mighty Ivy League to little land-grant school, boasts its own active technology-transfer office, eager to provide facilities and contracts. Beside ghostwritten reports and bad mentoring, the results may include flawed protocols and fatally mistreated human test subjects. The free marketplace of information, the historic core of science, is going out of business. Instead, short-term aims clothed in proprietary secrecy are on sale (for considerable fees) with an academic imprimatur. Chaucer gives way to computer programs and the demands of genome manipulation. Taxpayer-funded studies are subject to license fees, instead of being freely shared. While Washburn doesn’t suggest that the IRS investigate the unrelated business income of tax-exempt institutions, she does advocate specific corrective actions along the lines of improved legislation and third-party oversight. A heartfelt, well-documented exposé of a major rip-off that debases education in several important ways.